You have an infected ingrown nail. The fact that the toe is red, swollen, painful and you have noticed pus come out are all indicative of an infected ingrown nail otherwise known as a paronychia. There does not necessarily have to be a history of trauma to the toe for something like this to happen. In most cases it is usually a result of a person improperly cutting their nail. Sometimes it can be the result of wearing a shoe that is too narrow, while other times it may be due from the way the nail grows, meaning it has a natural tendency to grow down into the flesh. Whatever the reason, the nail eventually pierces the flesh, dirt gets in and it becomes infected. Soaking the toe in a salt solution may help, but in most cases will not rid you of the problem. Oral antibiotics alone rarely help and in most cases are totally not needed. out without anesthesia and no pain) will remove the side of the nail. 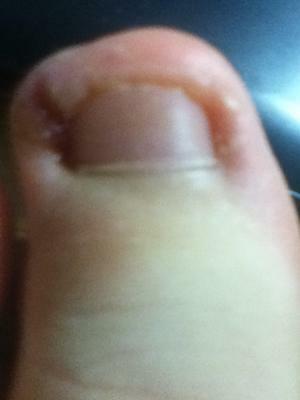 The whole nail does not need to be removed, just the portion of nail that is digging into the flesh. By removing a piece of the nail, you can then allow the infection to drain and with the application of topical medication, dry the infection out. If this is the first time this problem has occurred then that is probably all that needs to be done. If, however, this is a recurring problem in the same toe then there is a procedure that can permanently remove the portion of nail, so it does not keep growing back and reinfecting the toe. This procedure is also done in the office. I think it is very important to point out that this problem should have been taken care of months ago. Allowing the infection to be present for such a long time, aside from the pain aspect, increases the chances of the infection spreading to the bone, where you could end up with what is known as an osteomyelitis. This becomes a much more complicated situation as bone infections are much more difficult to clear up. So, my suggestion to you is to see a foot specialist as soon as possible, have a portion of the nail removed to clean us the infection and also have an x-ray to make sure the infection has not invaded the bone.